Whether its through search result manipulation, news feed algorithms, or blatant oppression of their political adversaries, Silicon Valley is now using its power and position to secretly influence public opinion and silence anyone who stands in their way. Chris Menahan, of Information Liberation, reports a similar phenomenon occurs when one searches for deaths from fentanyl, as well. Similarly, the term “opioid use disorder” has recently been adopted by health agencies and is one of Google’s top autocomplete results for the term “opioid,” appearing before “opioid epidemic,” “opioid addiction” or other more common terms. This is a thinly veiled attempt to put the onus on opioid users, rather than the corrupt pharmaceutical industry which created opioids, engaged in a reckless marketing campaigns and bribed physicians into prescribing their products. Big Pharma cannot hide from their role in creating the opioid epidemic, no matter how much the industry would like to do just that. Opioid-related deaths are continuing to rise, with drug overdoses ranked as the leading cause of death in adults under 50. Writing for UNZ, Sailer notes that Google alters other autocomplete results as well. Searches aimed at ethnicity, religion or sexual orientation do not produce results at Google. This is not surprising, coming from such a liberal company. 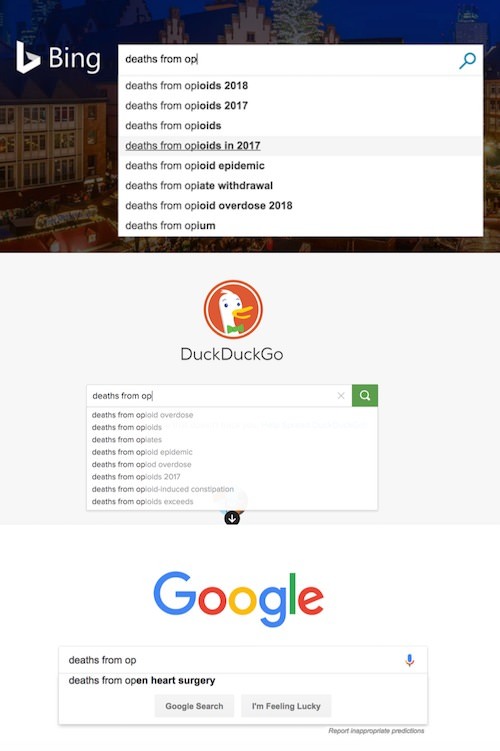 And it’s possible that Google is trying to use their power to change the tone of discussion on the opioid epidemic, too. Experts have begun cautioning that Google, and other tech companies, are becoming a dangerous threat to the free world. Companies like Google and Facebook dominate online conversation; between social media, search results, news feeds and everything in between, Big Tech is at the helm of the way the world communicates. And by gaining control of what information people see, these companies ultimately influence the way people think and feel. Google has already come under fire for censoring conservatives in the past, and there is a trove of evidence to suggest that the company is working to undermine the American electoral system, and much more. Regarding opioids, consider this: By altering autocomplete results, Google can shift the focus of the opioid epidemic away from the pharmaceutical industry’s undeniable role, and onto the people struggling with addiction. This shift can inform public attitudes about opioids in general. And with all the money Big Pharma has made on opioids, its no wonder these industries are colluding to paint things in a more positive light. See more coverage of Big Tech’s latest atrocities at TechGiants.news.